Christmas is an exciting time for residents living in Century Park communities. Holiday activities, family gatherings, Christmas concerts and festive entertainment keep residents in the holiday spirit. And, amidst all the business of Christmas, many of our residents make time to give to those in need. Kay Hall has been crocheting hats for T.C. Thompson Children’s Hospital for almost as long as she has lived at The Bridge at Ooltewah, Tennessee. Kay moved in two years ago, and after Bridgett Dallas, Lifestyle Services director, talked about crocheting hats for babies at the hospital, Kay decided to give it a try. Kay has neuropathy in her hands and can no longer paint, a passion she had for years. Knowing she needed to stay busy, and wanting to help children, she took on the task of crocheting hats. Although you would never know it looking at the hats she has created, Kay never crocheted before this. “My mother taught me when I was 10, but I never wanted to do it,” Kay says. So how many hats has she created? Kay says it’s hard to know. She estimates she’s crocheted more than 100 hats, but Bridgett believes Kay has crocheted many more than 100 over the last two years. 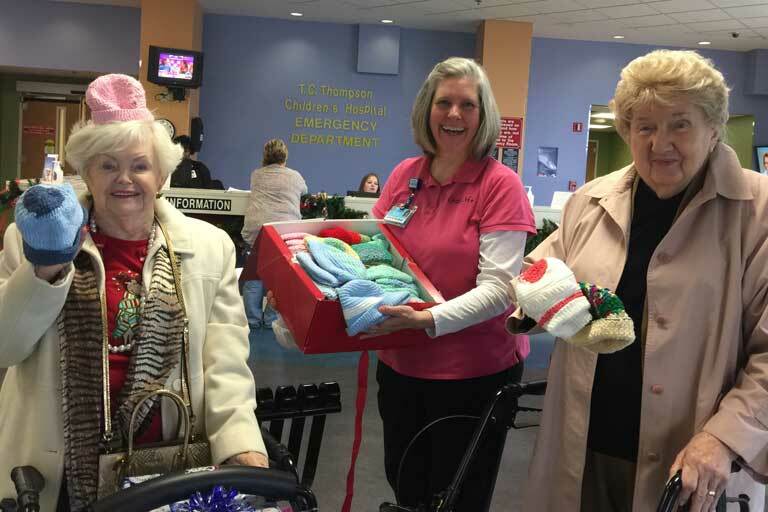 On Dec. 8, Kay, along with a friend and staff from her building, delivered the crocheted hats to the children’s hospital in time for Christmas. 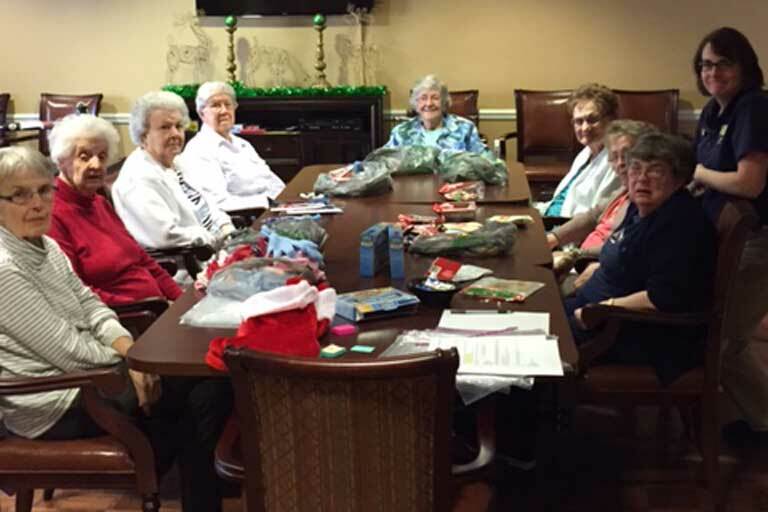 Meanwhile, in Elyria, Ohio, residents of The AbbeWood were hard at work making gift bags for their Community Care Center to distribute locally. 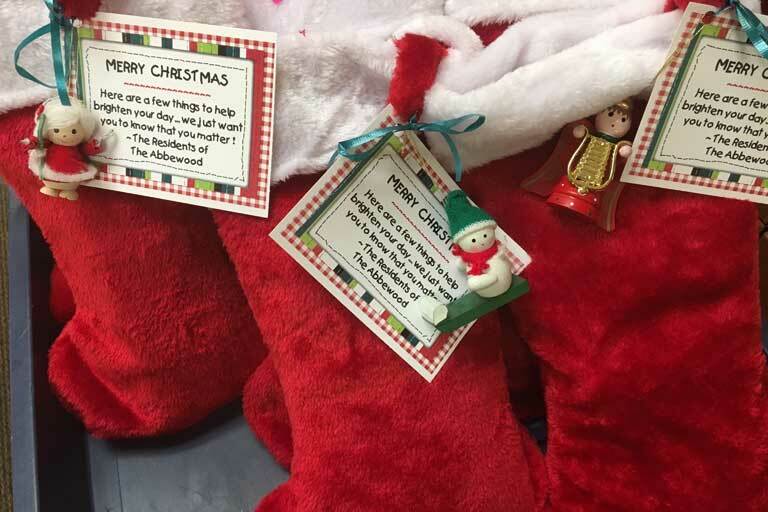 Residents work together to stock the bags with basic necessities such as lip balm, deodorant, toothpaste, tooth brushes, soap, hand sanitizer, socks, gloves and some holiday treats. This also gives the residents an opportunity to reminisce about other opportunities they’ve had to give back over the years. Our residents inspire us every day, and we hope this spirit of giving will encourage you and your family to take time out this season to give back to your communities.